A great "home away from home" We loved our stay at the Old Style Beach House where we could just walk across the lawn to the beach and Hanalei Bay. The house was very comfortable - good bed, good air circulation, ceiling fans and a well equipped kitchen. It is also close to Hanalei for restaurants and stores, and close to good snorkeling beaches. There are Farmers Markets in the areas with wonderful produce, and interesting gardens and nature areas to explore. It is clean and well maintained with a fresh growing orchid on the table, and more outside on the trees. It is not fancy, but charming and home like. We would definitely recommend it and stay there again. Old Style stay I loved this house. It was the perfect place to spend our honeymoon and the mountain/ocean view combo was amazing! It was also a great location- close to town (walking distance) and to all of the attractions on the North Shore. We will definitely be back! Perfect vacation This was the best vacation ever. Everything in the property listing was exactly as portrayed in description and photos. The house was very clean and anything we needed had been supplied. This vacation was a long time in the planning and the owner was extremely helpful and pleasant every step of the way. Whether you want to relax on the beach or be driving around to see the sights youll have whatever you need. I would highly recommend this listing to anyone looking for the perfect spot. Magical cottage on the bay I will be dreaming about this place for sure. What a sweet, earthy and accommodating place to stay and take in all the beauty surrounding. Everything was how we imagined it but better. I love the old, island-style decor and construction. You can hear the rain at night falling onto the lush, tropical greenery on the grounds as you could also hear the waves lulling you to sleep. The air smelled so good. Walk a few yards and youre sitting on one of the most gorgeous bays in the world. Rainbows galore. A truly relaxing getaway on the north shore of Kauai, super location, just about 10 minute walk to town to get a shave ice or to Tahiti Nui to do some people watching, have a mai-tai and listen to some ukelele and island music. Ive stayed at many places all over the island and this place is tops! Cant wait to get back! Old Style Beach house We stayed in The old Style Beach house. It was as special as always. I am a returning customer. It definitely is a magical place. It gets ahold of you and you dont want to leave. So close to the beautiful Hanalei Bay. Old style beach cottage This place is amazing! Location perfect for us we loved walking to town, sitting on the beach. Photos do not do this justice even better in person. One little thing I liked was the cottage had a few extras, small things like salt, pepper BBQ. Best vacation ever WE will be back for more than just 6 nights. The Old Style is a cute little cottage in paradise This little cottage on beautiful Hanalei Bay was the perfect place for celebrating our 40th wedding anniversary. The house was clean, the views spectacular, and we will always remember the beautiful sunsets and quiet strolls along the beach. Anyone would love this cute bungalow, except possibly those who enjoy only resort style vacations. As to not repeat previous reviewers positive comments, please read them below. We selected the Old Style based on these and other great reviews on the internet. So glad we did. Mahalo Terri & Suzanne! Absolutely a fabulous location! Our week stay at The Old Style Beach House was great! You can see and hear the ocean waves from the lanai and we loved the sounds of the surf lullaby each evening. The beach was maybe 30 yards away and walking down to the pier took about 20 minutes. Booking was easy with Terri and Suzanne who are friendly and helpful. We would definitely return! Aloha! Heavenly Hanalei We have stayed at the Kobayashi cottages several times before - this was our first stay in the Upstairs Beach House. We had absolutely everything we needed. The cottage is simple, but very comfortable. The views and the proximity to the magnificent beach are worth the price per night. There are many other rental properties on this beach, but very few at this price point. We will be back! Owner response: Thanks for the nice review. We look forward to your return. New Dad There is not a unit on this property that is not perfect. The Upstairs has to be my personal favorite, simply because my morning coffee, papaya, pastry was enjoyed with the postcard view afforded from a second story deck. If youre not sure on the location of this property be advised that it does not get any better. The large green lawn welcomes you back from your pristine gorgeous beach of the perfectly rugged mountain framed Hanalei Bay. A beach walk to the pier and back is so enjoyable it will have you conjuring business plans to afford you a property of your own fronting this paradise. That being said the Upstairs is a great unit for any vacation. Functional, simple, well maintained and clean enough to let a 7 month old crawl around. I hope to make this an annual tradition. Peaceful Paradise Everything about this rental was easy, relaxed, and wonderful. Will definitely stay again. Our Piece of Heaven on Earth Every 5 years, we spend our wedding anniversary at this property. It is beautiful! I cant imagine ever returning to the resorts on Kauai. We have everything we need here, and theres nothing between our lanai and the surf except some grass and sand. Though we planned to have a few meals out on the town, we also gathered food and supplies on our way from the airport. When we realized we didnt have or ran out of something, we either found it in the nearby grocery store or in the cabinets of the house. Sometimes, we rent a place and the spices and condiments left behind by others are greasy and stale. But here, it was almost as if everything was freshly stocked for us. Little details like a new, in-wrapper sponge for doing dishes remind me that this place is cleaner than my own house! And yet, this place does feel like home. The on-property washer/dryer means that we can wash our clothes halfway through the trip instead of packing more luggage. I cant decide what was the best party of staying here. Surfing perfect waves just outside our front door? Grilling our own meals, usually a local fish with some fresh vegetables and a $1 pineapple from the towns farmers market? Relaxing on the lanai while listening to our music on the houses stereo? Being located far enough down the road that we beat the crowds to the Kalalau trailhead and Tunnels Beach? It truly doesnt get any better than this. From leisurely walks into town to candlelit dinners, this place is near everything yet away from it all. I said it before and Ill say it again: we WILL be back! Upstairs Beach House It was our first visit, and we already to look forward to the next one. What a great beach house! The listing info and photos were very accurate. The place was actually even better than we had expected. An extremely comfortable house. And a large lanai w/ great views (and nice breezes). Absolutely Outstanding View of the ocean especially from second floor. House nicely laid out and comfortable. Beautiful view We rented the upstairs and downstairs suites for a week for the seven of us. Couldnt have had a better vacation, right on the beach, and just a nice walk into the village - just perfect! Wish we could stay forever. Perfect location in Hanalei Bay I can highly recommend this property. 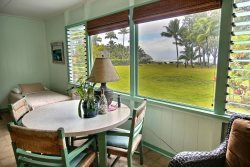 Situated in beautiful Hanalei Bay, walk across the garden to the beach. Beautiful maintained with everything available including beach towels, beach chairs, outdoor furniture and BBQ. Kids + Beach = Happy The house was wonderful! Especially with kids when it is important to be close to the beach! We will stay at the Downstairs Beach House again!